Eclectic Paperie: Join the 1st eclectic Coterie! Join the 1st eclectic Coterie! COME JOIN THIS GLIMMER MIST PARTY! We are really excited about our latest promotion. We are bundling both the Fall and Winter Glimmer Mist colors.....BUT hurry because this offer will expire on September 30th. It's just in time for some holiday shimmer. Purchase all twelve (12) seasonal colors for $79.99(plus shipping). FALL: Aspen Yellow, Autumn Leaves, Harvest Orange, Juniper, Merlot, and Red Maple. If we sell 40 bundles, everyone who purchased the seasonal bundle will receive a free bottle of Glimmer Mist Patina($6.95 value) absolutely free! NOTE: 15 Glimmer Mist bundles have already been claimed, so we need to invite 25 more friends. If we sell 80 bundles, everyone who purchased the seasonal bundle will receive both Glimmer Mist Patina AND Glimmer Mist Antique Brass($6.95 value) free. That's right....the more people at our eP Coterie, the more free stuff you will get with your bundle purchase. 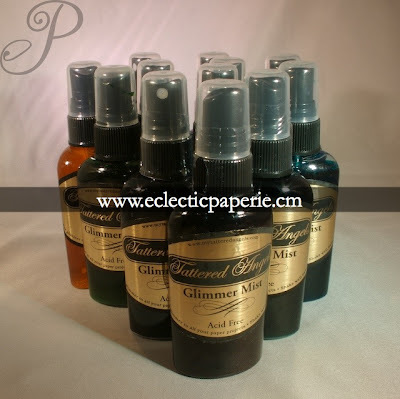 We'll keep you posted on the eP blog as to how many more people we need to invite in order to add free Glimmer Mist to your packages. So your mission is to share this offer and enable all your friends. The more people who join this coterie, the more Glimmer Mist we all add to your collection. These limited edition colors are only available for the fall and winter season. eclectic Paperie is making this exclusive offer through our blog and weekly newsletter. This eP Glimmer Mist special will not ship until the eclectic Coterie is over. Offer Expires: This offer is only good from September 18th to September 30th. eP Glimmer Mist Special bundles will not ship until early October. New Stickles colors have arrived! A lil' paint & bling can make a difference!